What do you do when your almost 7-year-old boy requests a safari themed boy’s birthday party, but not babyish, Mom? If you’re Madeline, of Maddylicious Cakes, you deliver! The cake, decorations, invitation and favors are all based on animal themed ideas, but the dessert table is stylish, boy- friendly, and has nothing babyish about it at all. 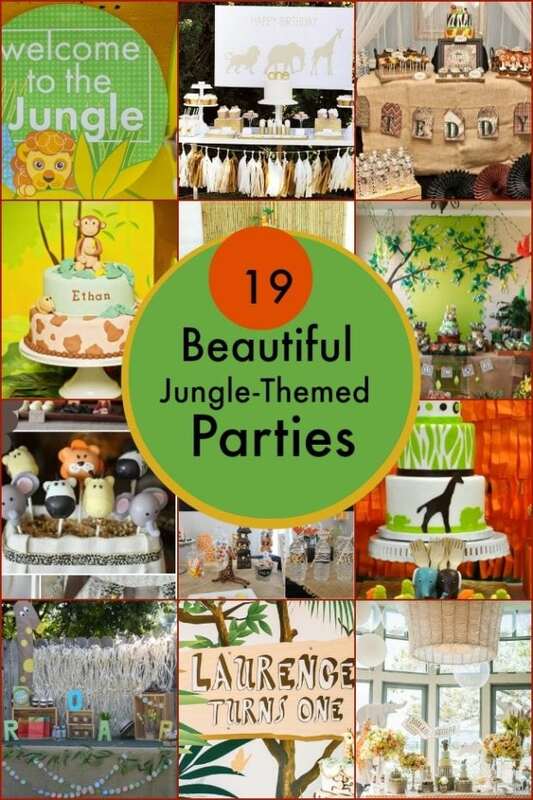 Take a walk on the wild side with these safari themed birthday party ideas. Your sweet tooth will be satisfied with this safari themed birthday dessert table. Maddy combined earth tones and animal prints to create this very handsome birthday party. She made most of the party goods herself using paper from a craft store”- clever lady! Paper lanterns were arranged as a backdrop for a pair of elephants trumpeting, “welcome” in block letters, painted with party colors. Loose weave burlap covers a black foundation table cloth and an animal print pennant fronts the table, along with the birthday boy’s initial. Black and white animal photographs above the table are a great tie-in. How fortuitous the pale grey walls and textured white curtains so effectively frame the dessert table; I love it when room colors don’t compete with the party décor! Apothecary jars in a variety of shapes and heights add a lot of interest to the table display. Animal figurines appear to “roam” between the candies, tarts and meringues. Even the water bottles wear coordinating animal prints. Favor bags add more color and pattern. The birthday cake is the star of the table, of course! The number “7” and top layer in animal skin patterns contrast nicely with the animal silhouettes on the orange toned bottom tier; a circlet of green leaves adds more punch. The pedestal is edged with an animal print repeat and Jaden’s name plus candles embellish the surface. A secondary table echoes the theme motifs; guests could find fruit kabobs and “wild” veggie cups in addition to the red velvet cupcakes here. A stylized animal mask benignly presides over the table and clear balloons keep the celebratory note going in a subtle way. Additional menu items included flat breads, bruschetta and pizza plus antipasto: salamis; prosciutto; cheeses; and tomatoes. A main party activity was the reptile show real, live reptiles! The guys loved seeing snakes, tarantulas, crocodiles, lizards and turtles! Maddy even held the crocodile and she was brave enough to have a snake draped around her neck, talk about making memories with your son! I’m pretty certain Sam won’t have the privilege of having that memory. After experiencing a full afternoon of fun, guests left with animal print favor bags filled with animal print sunglasses, arm bands and mini cameras. Madeline proved that not only is she a good sport, she can deliver the goods! Love this animal themed boy’s birthday party? Get the look with these supplies.